Originally published on UXPA Magazine. Layout adapted for portfolio and UX purposes. Great UX is data-driven. The data itself is usually seen as numeric quantitative data, but in many contexts, that’s not a sufficient descriptor. Let’s take online shopping as an example. We browse online for the best prices, visit retail stores for comparison, and may end up purchasing in-store, or may even buy a completely different item. However, we are usually left with a lingering re-targeted ad on Facebook based on browsing history. Perhaps seeing the item repeatedly persuaded you to purchase the item, but were the ads truly relevant or did they just become intrusive? My point is, the data-driven design we experience today is typically A/B testing and algorithmic re-targeting, and I believe it’s beyond that. If you do an online search for “data-driven design,” you will receive a flood of results about A/B testing and programmatic ad placements. It makes sense; data-driven design conforms to users’ preferences, goals and behaviors. The emphasis is usually on A/B testing and programmatic ad placements, which are based on user behavior—quantitative data insights. If you A/B test two different call-to-action designs on a website, you may see a drastic difference in receptiveness. But surely there must be more that’s responsible for conversion than a beautifully designed button or eloquent copywriting. A/B testing is a great means to gauge optimization and indicate user preferences, but pinpointing users’ wants requires more depth. A well-orchestrated user experience utilizes both qualitative (qual) and quantitative (quant) data insights (see Figure 1) to bring about relevancy … with a dash of surprise. Figure 1. 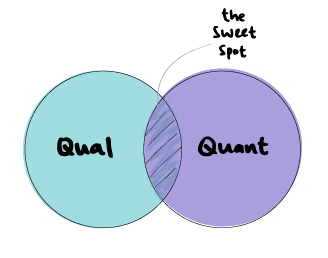 Effective data-driven design lives in the sweet spot of combined quantitative and qualitative data. My educational background is rooted in the hospitality field, where everything is centered around the guest. This is similar to the user in UX, and it has been the guiding principle in my design work. I once waitressed at a restaurant that served finger foods, but no damp paper towels were provided for the aftermath. The staff workaround was to wet napkins with water, but that’s not an efficient or sustainable solution. I later realized this was an example of where quantitative data alone would not have alerted me to the issue. Direct guest interaction (user feedback) indicated a need—a qualitative data point. I had no idea what “user experience” meant at the time, but I knew what good hospitality was. And now it all made sense: Everything is designed around the guest, or the user. What defines great hospitality is the human touch, the element of empathy—those qualitative data insights. Hotels have been tracking guest behavior for decades based on quantitative analysis of their travel choices, including room type, amenities, dining, and travel patterns. Combined with qualitative data such as user feedback, all these data points allow us to understand user motivation and thus provide the best and most relevant offers. Successful UX should adopt a similar approach in the context of user journeys, through consistency and contextual relevancy. Consistency: Consistency cultivates trust. The hospitality industry is all about consistency, including the check-in experience, tone of voice in communication, and housekeeping standards. Great UX keeps each touch point consistent. Contextual Relevancy: Putting things in a context users relate to builds relevancy. For example, drawing parallels about a neighborhood for a first-timer in a new city, such as, “it’s like SoHo in New York,” can quickly provide perspective. Similarly, effective UX recommends the relevant product or experience to the user at the right time. Quant data is based on behavioral transactions and their frequency. Thanks to advances in data science and AI, we can deep-dive these behaviors and predict the propensity of users behaving a certain way. The good thing about quant data is that they are easy to retrieve and analyze. In the online travel industry, for example, there are all sorts of metrics at your fingertips that can help predict a user’s likeliness to convert, including search behavior, hotel or flight booking frequency, and brand preferences. The key is to extract the relevant ones and utilize them as features when communicating to the user. I’ve had the opportunity to work with several talented data scientists who used machine learning algorithms to calculate the propensity of a user’s behavior. This approach increases accuracy and relevancy. When defining propensity, it can be the likelihood to convert, to book the same hotel again, to book a flight to a country with similar characteristics, or simply the likelihood to travel again the same time as last year. Qual data, on the other hand, is based on user motivation and typically acquired from user research and focus group interviews. Such data sheds light on why people do what they do, and uncovers patterns otherwise not indicated by numbers alone. You can place a remotely statistical figure on what people agree or disagree with, but extracting these insights are much more valuable. Qual data is hard to measure and track, which is why some UX practitioners engage user personas to cluster different groups based on similar behavior or characteristics. In order to provide contextual relevancy, I previously experimented with an engagement piece, a survey paired with interactive landing pages. 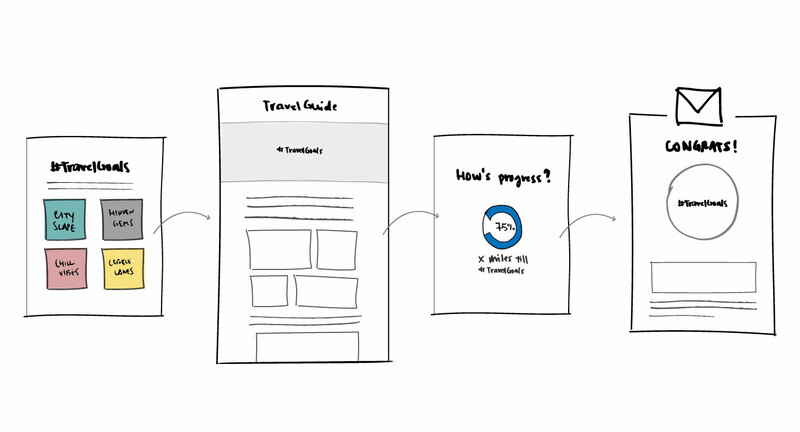 It’s a great way to collect qualitative data points about users. Gamification has its roots in user motivation and habits. In other words, it’s a system of game elements that keep users hooked, which is a great sign to being a successful brand. When users get hooked, they are hooked to the rewards and find value in your product or service offering. Adherence to the reward system is a behavior wired in our brains and universal to any culture. It’s a universal human motivation and want. I launched a campaign called #TravelGoals to experiment with gamification. I learned that not only does this method serve as a great framework, but its fundamental principles in user motivations are universal, regardless of cultural differences. The idea of #TravelGoals (see Figure 2) was to help users attain their travel goal by keeping track of their progress, recommend offers to fast track their success, and eventually celebrate their moment of triumph. For a travel loyalty program, this builds contextual relevancy for the user by earning sufficient miles to reach their goal: redeem a free flight. Figure 2. The idea of gamifying #TravelGoals was to help users attain their travel goal by keeping track of their progress. The experience: Set your travel goal. Check out a travel guide. Track the progress of collecting travel miles. Celebrate your win in the end! Just like the previous approach, I used existing quant data to get a sense of the user profiles and based on that, communicated with an engagement piece to further understand users’ likes and preferences. Finally, I followed up with a final offer based on their profiles and survey answers. In order to make it more contextually relevant, I adapted the survey to include elements of local Hong Kong user lifestyles and cultural contexts (see Figure 3). Figure 3. 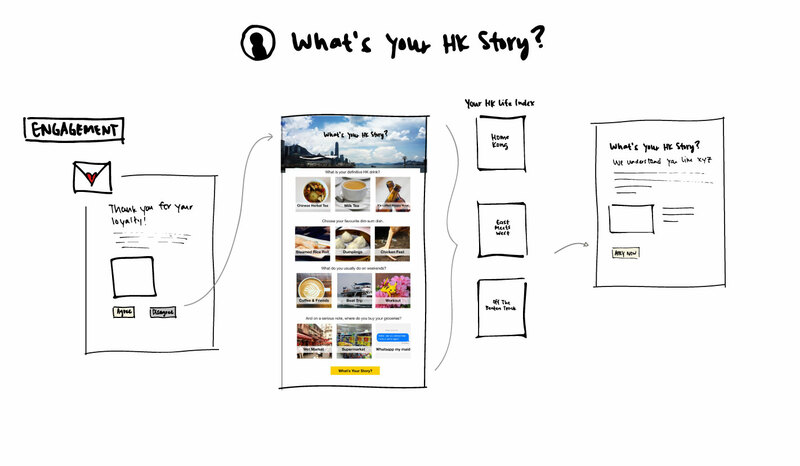 “What’s Your Hong Kong Story?” began with an email to spark engagement, followed by a Buzzfeed-type quiz to gather preference data. The quiz includes images of drinks, food, and experiences in Hong Kong. A “Hong Kong Lifestyle Index” was generated, which determined what offer email was delivered. Going back to the example of online shopping, I’ll use a personal story to illustrate how using quant data alone may result in missed opportunities. Figure 4. The online shopping journey to buy a dress includes (1 & 2) browsing sites to look for a dress, then (3) a cookie tracks my behavior and a re-targeted ad (4) shows up via email and on Facebook. A decision is made (5) and the dress is purchased in-store instead. However, (6) the same re-targeted ad is still there. As you can see, the interaction from online browsing to offline purchasing is a broken process, and we have no visibility into it. From the user’s perspective, I only found the re-targeted ads intrusive and redundant. Instead, if the system had been set up to track my behavior in the right way (see Figure 5), my re-targeted ad after conversion may well have been a pairing suggestion. That, to me, is more valuable. Figure 5. A more effective online shopping journey to buy a dress includes (1 & 2) browsing sites to look for a dress, (3) then a cookie gets tracked on the back-end and (4) a re-targeted ad shows up via email and on Facebook. (5) A decision is made and the dress is purchased in a store. (6) In this case, a suggested pairing for the recent purchase is shown instead. Data-driven design is a very creative space. Don’t limit yourself to just A/B testing and programmatic ad placements. They should serve to increase awareness and exposure, but not used as conversion tools alone. It’s important to keep experimenting with both quant and qual data inputs. Remember: The core of all is user wants.